The Delta S is delivered in 275-gallon totes weighing about 2,200 pounds. Here the team working at CSA Materials set up the Moyno Assembly to pump Delta S into the plant at a rate of 1.64 gallons per minute. 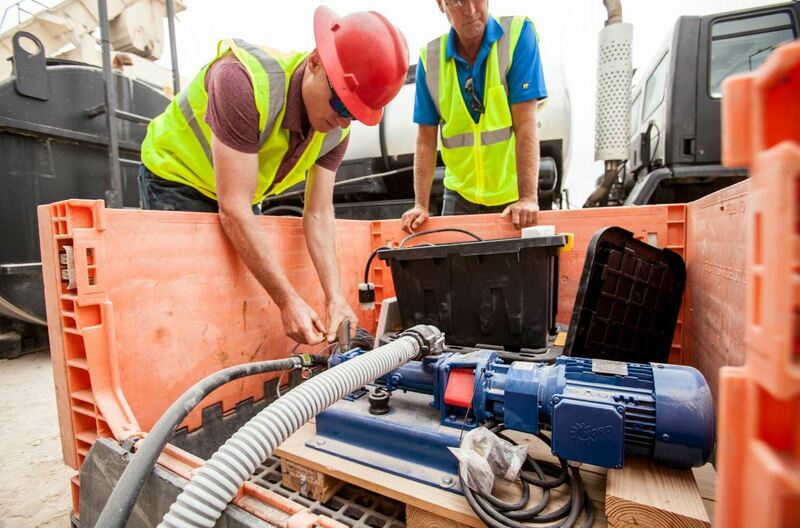 Steven Twining, a system technician for Rub-R-Road, Kent, Ohio, ran the pump to deliver the Delta S.
Finding the right materials for statewide use is a monumental task when you have an area as big as Texas. 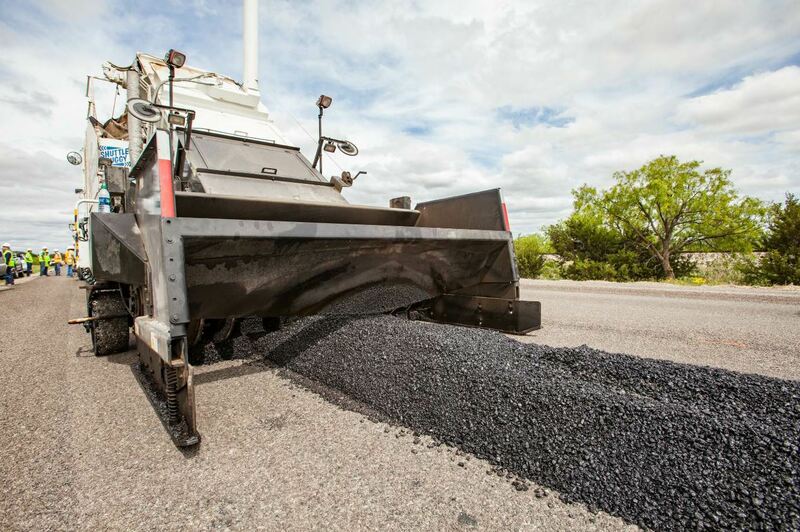 State materials engineers for the Texas Department of Transportation (TxDOT) are charged with finding ways to increase the amount of reclaimed asphalt pavement (RAP) used in asphalt pavement mixes, and lengthen the life of pavements in which it appears over 268,597 square miles of differing climate. 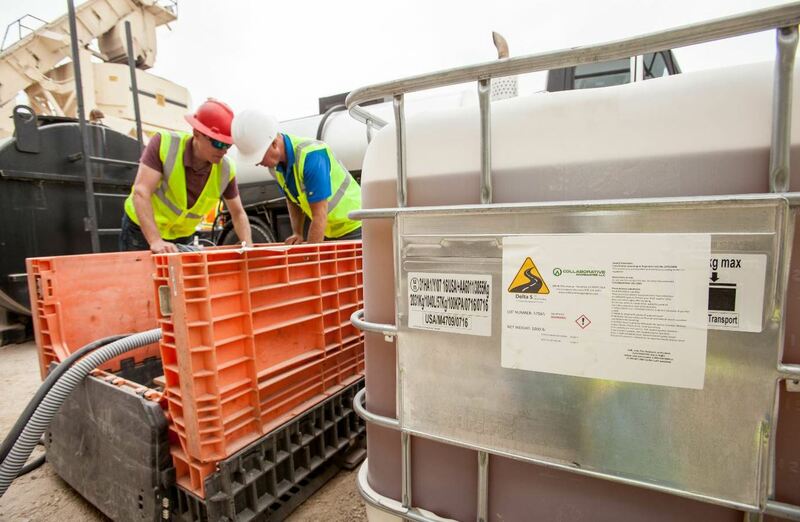 While discussing the process for approving Delta S technology as a warm-mix asphalt (WMA) additive, TxDOT’s Ryan Barborak, P.E., suggested to Jay Bianchini, Ph.D., that the plant-based rejuvenator be part of the recycling agent testing taking place near San Angelo in the spring of 2017. Bianchini is the vice president of operations at Collaborative Aggregates LLC, Wilmington, Massachusetts, and he shared part of the protocol. Delta S works by reversing oxidation of the asphalt cement (AC) through a carrier matrix. Bianchini explained that the plant-based carrier oil literally carries the remainder of the product into the existing asphalt binder where the other components of Delta S perform the chemistry of softening and reversing oxidation. Here Fujie Zhou (center, yellow hat) and William Still (white hat) discuss a sample of mix taken from the truck. “This represented the final test sections in the recycling agent testing,” Bianchini explained. “Four locations throughout Texas conduct testing similar to this. They have the advantage of having a large state and a wide variety of weather conditions, so they spread the testing throughout Texas. 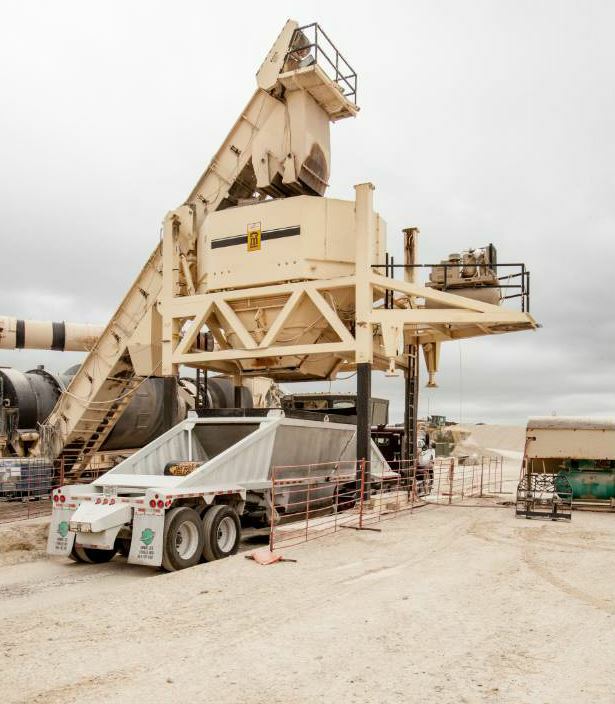 The final project in April 2017 involved three different recycling agents plus two control sections; sister companies CSA Materials Inc. and Reece Albert Inc. of San Angelo; and the team at Texas A&M Transportation Institute (TTI), College Station. That’s a lot of moving parts, yet the professionals on the job brought it all together. Fujie Zhou, P.E., Ph.D., is a research engineer at TTI and shared that they used a balanced mix design method, originally developed at TTI, to design the rejuvenated asphalt mixes for the test sections, focusing on the rutting, riding performance and cracking performance. At this time, asphalt pavement mixes that include a high percentage of RAP replacement binder potentially experience premature cracking. This predilection is attributed to the oxidation—or aging—of the RAP binder in the mix. To restore youth to the RAP binder, researchers in our industry test rejuvenators at varying dosages in hopes of delaying cracking while increasing the use of recycle content. 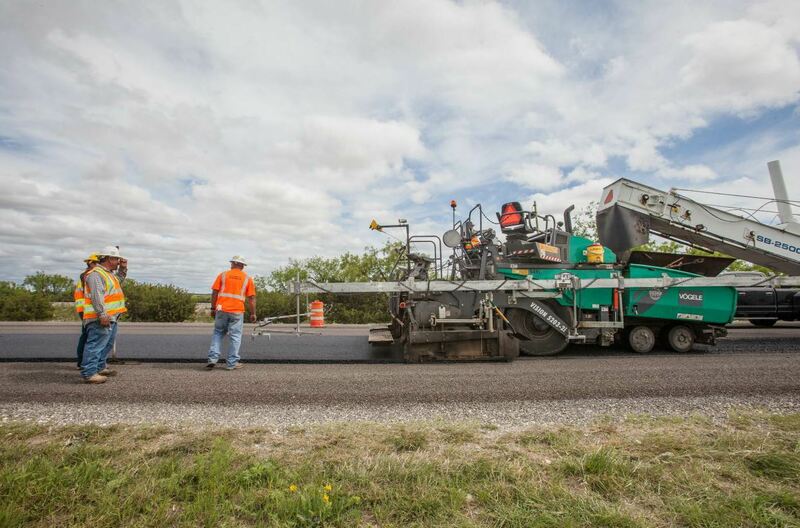 That means TxDOT had a ready partner in TTI to work on U.S. 67 for its materials testing. 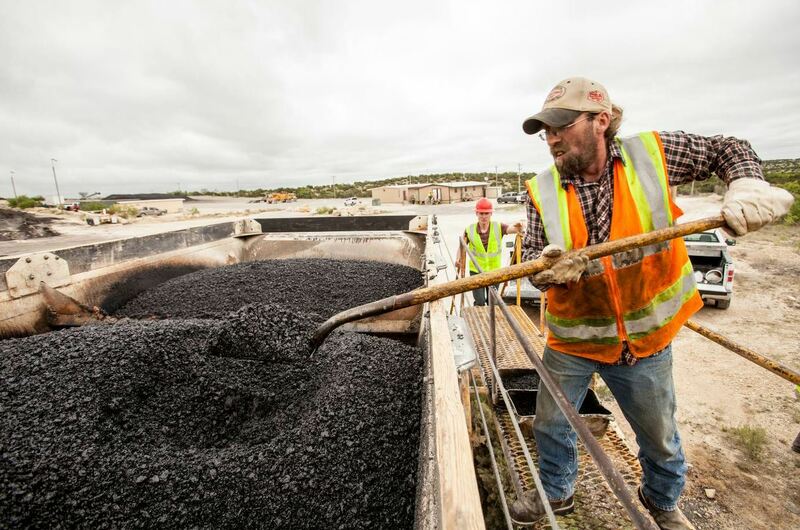 Zhou confirmed that the crew from Reece Albert Inc. placed a dense-graded mix containing 13 percent RAP with no rejuvenators along Westbound U.S. 67 for the majority of the project. Haul truck drivers brought the material to the job site in belly-dump trucks, which placed windrows ahead of a pickup attachment on a Roadtec SB2500e material transfer vehicle. The Shuttle Buggy fed a hopper insert in a Vogele Vision 5203-2i wheeled paver. Two Hamm HD+ 140i rollers achieved compaction of the 2-inch lift. Zhou stated the entire project used 5.3 percent PG64-22 binder. William Still, the asphalt production manager at CSA Materials, confirmed use of a CMI counterflow plant, working at almost 300 TPH. One 400-ton section of the dense-graded, 13 percent RAP sub lot represented the first control section. Then the team at CSA Materials Inc. produced a second control section of about 400 tons with 21 percent RAP and no rejuvenators. The next sub lot to be produced was about 400 tons with 21 percent RAP with an additive from an individual entrepreneur who brought his own distributor truck to heat and pump the material. Each sub lot was approximately 400 tons, paved 2 inches compacted, produced at 275 degrees F.
The next sub lot to be produced was about 400 tons with 21 percent RAP with the Delta S additive from CollAggs. For this section, the plant ran at 240 TPH and the pump rate was 1.64 gallons per minute through a Moyno Assembly with Compact C pump. The final sub lot to be produced was about 400 tons with 21 percent RAP with an additive from a chemical manufacturer that supplied its own pump. 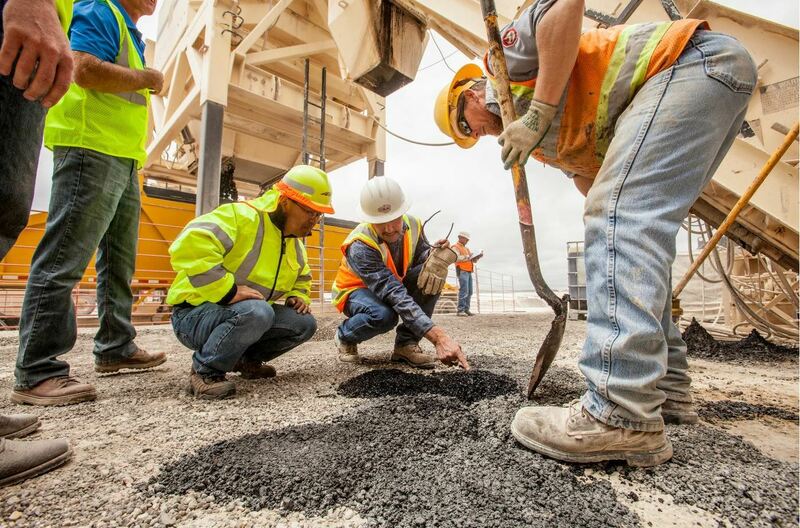 Improvements start with the materials used in the mixes, and carry through to paving performance. 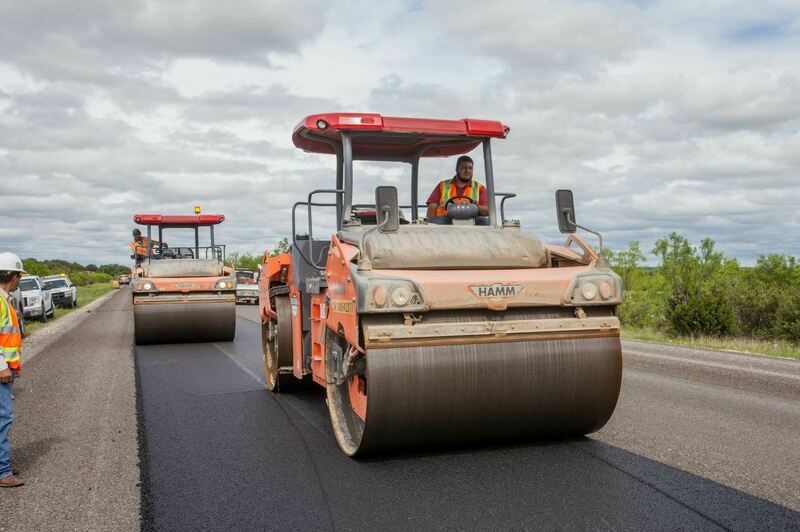 For the mixes placed on U.S. 67, the Reece Albert crew had no worries to report. Bianchini was on site for both production and paving. Still confirmed the paving crew had no problems with any of the sections, with all three performing similarly for the crew during placement and compaction.